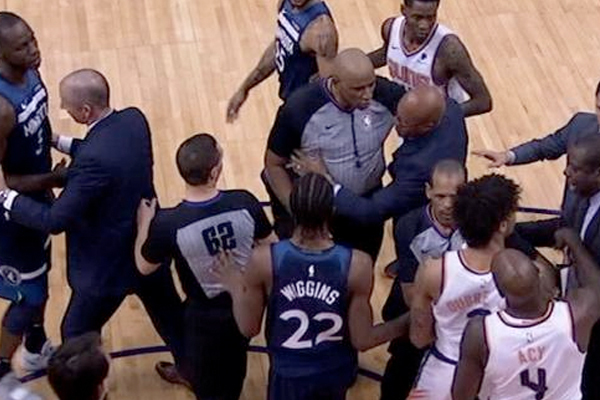 Things got a little heated on Tuesday when the Suns hosted the Timberwolves. In the third quarter, Devin Booker and Gorgui Dieng were involved in an on-court incident. The two players confronted each other and Booker put his hand in Dieng’s face and appeared to shove him. Both players were ejected, but it wasn’t over yet. As they were being escorted off the court, Booker told Dieng to meet him in the hallway. Security was on “high alert” and “both locker rooms were locked to prevent anything from happening, but that didn’t stop Dieng from trying. He fought off two security guards and got within 15 yards of the Suns’ locker room before being restrained. He then joked that he just wanted “to exchange jerseys” with Booker and he defended his actions and questioned the reasoning behind his ejection claiming Booker was the instigator. Don’t expect a repeat of this Booker-Dieng altercation because the Suns and Timberwolves will not be seeing each other again this season.